Spotify just leveled the playing field for Windows Phone users after promising improvements back in May. On Tuesday, Spotify announced that the ad-supported version of Spotify was now available on Microsoft's mobile platform. Before the announcement, Windows Phone users who wanted Spotify on their phone had to shell out $10 a month for Spotify Premium. Android and iOS users, meanwhile, have had ad-supported options on mobile since December. The change means that Windows Phone users can enjoy similar benefits to the two larger smartphone platforms. You can shuffle playlists made by you or others or listen to a specific artist on shuffle. Spotify says the new Windows Phone app also features an improved look for search results and browsing artists is simpler than before. One thing that hasn't yet landed on Windows Phone, it seems, is Spotify's black visual overhaul that began rolling out in April. The new look puts more focus on the musical content and de-emphasizes the app's interface elements. 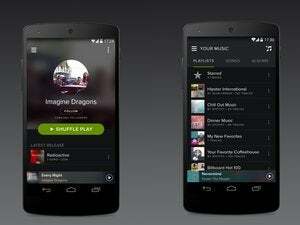 In May, Spotify did say the new look would be coming to Windows Phone eventually. Even without the drastic visual overhaul, the new version of Spotify is a big win for Windows Phone users and Microsoft. One of the drawbacks to Windows Phone is that it still doesn't have the big app draws that Android and iOS do, although the app catalog has improved in recent months. With Spotify's service on Windows Phone now on par with Google and Apple's mobile platforms it gives users one more reason to consider a switch. As with Android and iOS, Spotify Premium is still available on Windows Phone with features such as higher bit-rate tracks, offline listening, and full access to Spotify's catalog. The new version of Spotify for Windows Phone is available Tuesday from the Windows Phone Store for Windows Phone 8 and 8.1.